Fiona Horrox, Senior Lecturer in the Department of Children's Nursing at London South Bank University, has developed a module as an app for Apple devices. The app, called Resuscitation was developed by an American Accident & Emergency Doctor and is sold by EM Gladiators LLC. The app is a virtual patient simulator that makes learning medicine and nursing both fun and engaging. The module within the app is called Paediatrics UK & Europe. The app consists of 10 paediatric scenarios presenting a child who is acutely ill with the user playing the role of a doctor or nurse. As the doctor or nurse the user can take a history, perform an ABCD primary and secondary assessment, form a differential diagnosis and administer therapy to treat the patient's underlying problem. The user can also place the patient on a cardiac monitor, perform suction, administer oxygen, start IVs, put in a chest drain, perform a radiological study, administer a vast number of clinically important medicines and call consultants for advice. As the user progresses through the app they are awarded points for critical and bonus actions and penalised for unsafe or unnecessary ones. Once the case has been completed, the scores are displayed with an explanation for the users mark. A discussion paper backs up the intervention and links in current evidenced based practice and guidelines. 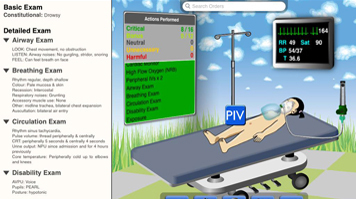 The Paediatric Module within the Resuscitation app is a technical medical simulator and is designed mainly for health students and professionals who are interested in the acutely ill child. The first case is free and the remaining 9 cases are only £2.99.